Hey everyone! New to eurorack modular synth so I am looking for some advice! This is the setup I have right now to learn some of the basics without having had to spend too much money on it! In looking towards making some sequenced ambient music, what does it look like I am missing? 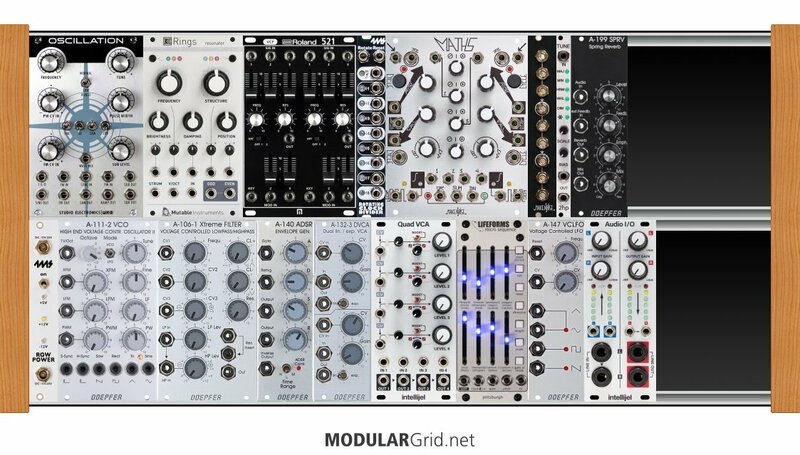 Is there an essential module that you think I should get? Additionally, I have a Juno 60 and a Korg ms20 mini. In looking to connect this system with those synths, what should I get. Is there a cv hub/clock that could help with that? First up, the sequencer. If you're trying to do heavily-sequenced pattern-based stuff (Berlin school-ish), that little 8-stepper won't cut it. You need something that you can directly work with while it's in action, like how Chris Franke would literally play his banks of Moog 960s. I'd suggest something that internally quantizes, also. My inclination would be toward The Harvestman's Stillson Hammer mk II, but with that 8-step and some other trigger sequencing to increase the possible complexity by crosspatching them with the SHmkII. This wouldn't bring the MS20 into the mix, though. Another possibility would be to go outboard, which is what I do with a pair of Arturia Beatstep Pros and a Keystep at present. This would then open your system up to some external control. The most extreme thing of this sort that comes to mind immediately would be the Koma Komplex. It's worth noting that the BSPs as well as the Komplex can be programmed to deal with the Korg's Hz/V scaling and inverse triggering...the BSPs require this be done in their PC software utility, while the Koma can be changed directly. Plus, if you use a Keystep or any other USB controller, Expert Sleepers' FH-2 can function in MIDI Host mode over USB, so those can be plugged directly into the modular there. As for the Juno...that's more problematic. I assume you know that this requires either one of Roland's DCB-MIDI adapters or the JSQ-60 sequencer to link it in for pitches. However, you can send a clock pulse to the external trigger input to sync the arpeggiator, which would be a much simpler fix than hunting down esoteric Roland accessories and allow you to 'play' the arpeggiator as another sequencer channel. As far as clocking goes, any modular trigger pulse will work on everything BUT the MS20. In that case, you need something like The Harvestman's English Tear, which is a bidirectional converter for Euro MS-20 signals. With that, though, you can then run the MS-20 alongside anything in the modular and it'll respond properly to Eurorack CV/gate/trig signals. Thank you for your input. I agree a better sequencer would be a good idea. I love the idea of getting the SMmkii. I had no idea the ms-20 did not communicate well with eurorack. Getting the English Tear would be an easy fix for that to help trigger it. And with the Juno, if I could just sync the arpeggiator I would be happy, no need to trigger it right now. Could the SMmkii act as the central clock? I would love to get something with an actual digital bpm display to help with accurate tempo! The Stillson Hammer mkII can definitely function effectively as a master clock. It even has a direct clock out with no division/multiplication as a normalized patchpoint. Given that, you could easily run a trigger sequencer such as a Four Bricks Rook, Circadian Rhythms, Knit Rider, etc from that to provide various rhythm patterns in sync to pass on to the MS-20, Juno, etc, plus most any sort of clock modulation module will work nicely for clock maths. An outboard Korg SQ-1 might be just the thing for keeping the MS-20 in check with the rest of your system. SEEK or the Varigate 4+ are other nice sequencers to check out besides SHmkII. Also have you thought about any FX in eurorack or a mixer? Also why not get another VCO, noise source and a WAV player like TipTop One or Pico Drums to get some different flavor in there for small HP. So I think for the price, I am going to grab a beatstep pro. Itll help me with having extra sequencing power without taking up room or costing too much. The Korg SQ-1 does seem nice for the MS-2o, I might want that in addition to the beatstep! That would give me two 16 step sequencers (BSP) 1 8 step (Lifeforms) and then two more 8 steps from the Sq-1. Do you all think that is a good enough amount of sequencers and would they all play well together? FX are on my list down the road. What are some top ones for more ambient and sequenced music? Obviously a good reverb and delay, but what else would you suggest? Actually, that sequencer complement isn't all that different from what I presently have (2 x BSP, SQ-1 [for my own MS-20], Keystep) in addition to the various incorporated ones in other synths. And yes, they all play very nicely with each other. My plan for later this year is to cap this off with a Koma Komplex and use that as a 'hub' for all of the other hardware sequencers + direct interfacing with my modular. This'll then free up a BSP to use as a drum sequencer for an ancient MXR Drum Computer which has a blown sequencer but which recently received a trigger-in 'fan' for this exact purpose. VCOs aren't the whole problem with how VCOs sound, btw. Very pure VCOs tend to sound rather meh, so by putting some things inline with them that introduce some nonlinearities, you can beef their sound. Also, just one VCO is probably two fewer than you need, because you want some slight detunings and waveform nonsynchrony to get a more interesting sound. The whole key to the Minimoog sound is, in fact, these two things; not only do the VCOs have a tendency to drift slightly even when warmed up, the Minimoog also contains the guts of the CP3 mixer for mixing these...and the CP3 isn't a very clean mixer, but it's not clean in a musical sort of way, if that makes sense. Feed that on to the classic LPF on there, and that's "that sound". As for effects...unless you want something non-replicated in outboard (such as Intellijel's Rainmaker), my suggestion would be to grab some cheap outboard devices and a 1/4" patchbay for them, then have fun routing all sorts of processing cascades, insert loops, etc. That is great advice Lugia! Thank you! I think at least one more VCO is a good idea! I have plenty of outboard gear (and plugins) so I have plenty of post processing capabilities! One thing I am looking at is being able to send the same signal to multiple locations. So having the pitch control from the sequencer affect the Ring module and the VCO. Is the A-180-3 a good choice for that? Any basic mult should work. You're not sending the CV to a bunch of different locations, so there's no worry of a voltage sag and no need for a buffered mult. I'd suggest using some inline mults; save your cab's room for actual functionality. Alright, Update. I got the Beatstep Pro and the Make Noise Mult Passive Multiple Eurorack Module. Pretty excited about seeing how these two expand my current setup.